The University of Virginia's Miller Center of Public Affairs hosted the Presidential Sites and Libraries Conference, “Renewing Ideals and Engaging the Public,” from June 21 to 24, 2010. 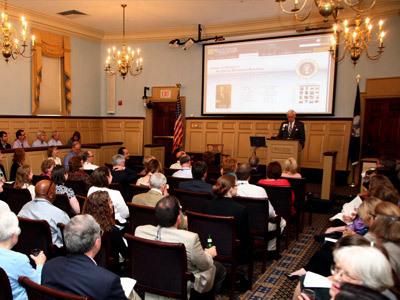 Conference participants included presidential sites and libraries directors, government officials, presidential scholars, members of the media, and representatives of institutions engaged in the preservation, restoration, education, and presentation of the lives and works of U.S. presidents. Speakers included Michael Beschloss, leading presidential historian; Joseph Ellis, Pulitzer Prize-winning historian; Jon Meacham, editor of “Newsweek” and Pulitzer Prize-winning author; and Annette Gordon-Reed, author of the 2009 Pulitzer Prize-winning book, The Hemingses of Monticello: An American Family. Additionally, scholars from the Miller Center's Presidential Oral History and Presidential Recordings programs presented their work. Select content from the conference is available for download below. 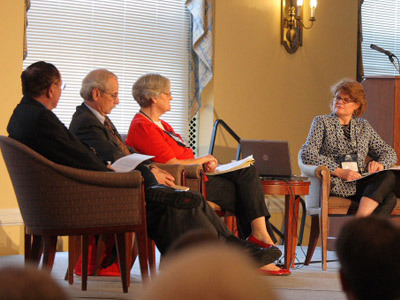 The conference was sponsored by the American Association for State and Local History; James Madison’s Montpelier; Miller Center of Public Affairs; Monticello; the National Park Service; the National Archives and Records Administration; President Lincoln’s Cottage, a National Trust Historic Site; and the White House Historical Association. 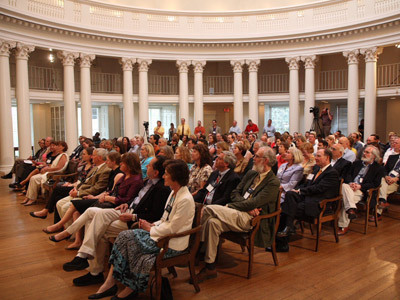 On the opening evening of the conference, attendees gathered at the historic Rotunda, Thomas Jefferson's masterpiece at the heart of the University of Virginia. The evening began with an elegant reception on the Rotunda's South Portico, facing the University's original "Academical Village." 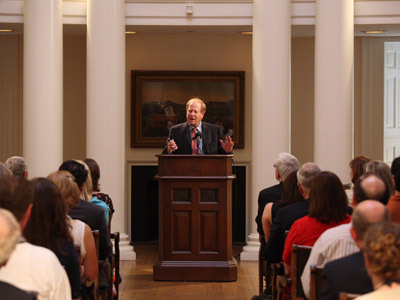 Following the reception, guests ascended to the architectural and philosphical model of Mr. Jefferson's University, the Dome Room, for a special keynote address by Pulitzer Prize-winning historian Joseph Ellis. Scholars from the Miller Center's Presidential Oral History Program (POHP) assembled a round-table discussion to examine the history of presidential oral history, what oral history contributes to our knowledge about the presidency, the Miller Center's distinctive methods of interviewing; the POHP's relationship to the respective presidential libraries, and the enlarging scope of the Program's work. Utilizing presidential sites and libraries as the nation's "crossroads" institutions where current scholarship meets public history and visitor expectations, this session examined how some sites are addressing topics such as race and ethnicity, both in the past and in the present day. 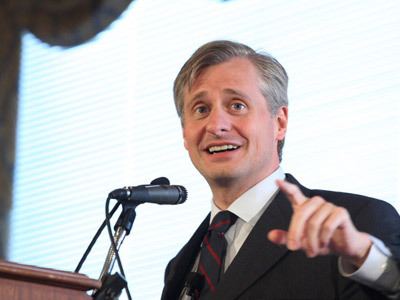 Editor of Newsweek magazine and New York Times bestselling author, Meacham is the author of Franklin and Winston: An Intimate Portrait of an Epic Friendship, a chronicle of the wartime relationship between Roosevelt and Churchill and American Gospel: God, the Founding Fathers, and the Making of a Nation, a historical portrait of the spiritual foundation of America. He edited Voices in Our Blood: America's Best on the Civil Rights Movement, a collection of distinguished nonfiction about the mid-century struggle against Jim Crow. Meacham's newest biography, American Lion, is about Andrew Jackson and his White House circle. A bestseller, it was awarded the 2009 Pulitzer Prize for Biography. 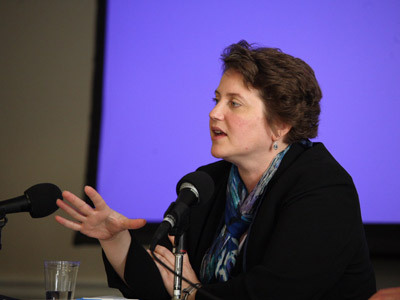 The Miller Center's Presidential Recordings Program (PRP) presented how to use archival materials—namely, presidential recordings—in the classroom to engage students in the study of important aspects of modern American history. Like so many archival materials, in their raw form the presidential recordings are not well suited to classroom use. Through providing materials freely on its website, preparing and publishing transcriptions, and providing historical context, the PRP aims to make the White House recordings accessible. PRP scholars also shared their methods, tools, and experiences of the Program's pedagogical outreach. p>Our public increasingly expects high-end technology and access to our institution's offerings through up-to-date technology onsite and through the Internet. 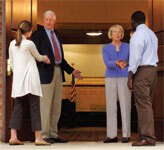 Keeping up with these expectations revitalizes our visibility and brings new audiences to our institutions. Institutions look to partners to bring expertise and creativity to projects and to help defray the costs. But what are the realities of creating and maintaining partnerships? How might these collaborations differ between corporate partnerships and university partnerships? In this session, Duke Blackwood discussed partnering to enhance the museum visitor's experience at the Reagan Library and Museum. 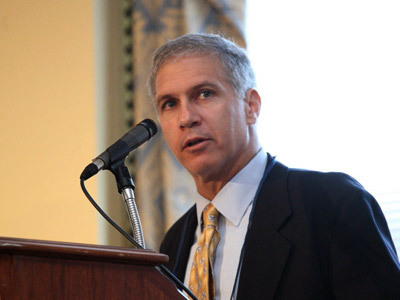 James Roth detailed the issues involved in creating and maintaining partnerships with several corporations to digitize and make available archival records. Paul Resta discussed the partner's perspective in an academic environment through The University of Texas at Austin's partnership with the National Archives Office of Presidential Libraries and the Lyndon Johnson Library and Museum. The four presidential sites represented in this session have recently opened spaces to augment the visitor experience at their historic structures. The speakers who hold diverse positions within their organizations shared their experiences planning and creating these centers. Each panelist addressed the reasons for making the new facilities, lessons learned from their projects, and thoughts on how to translate what worked well in their experiences to sites of varying sizes and operating budgets. The trend toward exploring new uses for old houses is reaching presidential sites, which have a long history of offering traditional interpretive programming. 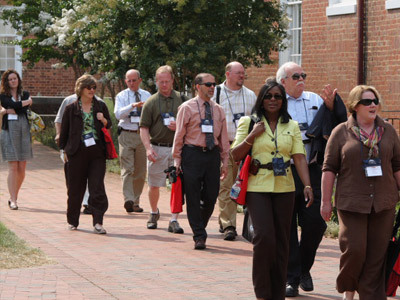 From low-cost technology delivery systems to transferring tried-and-true classroom techniques to historic homes, this session explored several new programs that may translate well at your site. Carol Hegemen highlighted the Junior Secret Service Program for ages 7-12: students make use of binoculars, radios and a training manual to learn how the Secret Service protected the president. Courtney Speaker presented on Paths to Freedom: Slavery, Emancipation, and the Power of the President, an elementary school field trip at Decatur House on Lafayette Square. (The White House Historical Association has recently established the National Center for White House History at Decatur House and is in the early phases of master planning.) Paths to Freedom is a pilot program that allows students to recreate historical scenes using 19th-century interiors as their stage settings. Michelle Pearson demonstrated a program she created with her students, utilizing Google Earth, that allows learners to explore their neighborhoods while in search of places associated with the presidency, in this case a trip to Denver by President Eisenhower. Individual possessions of the Founding Fathers gained instant special stature because of their association with "great men." Antiquarians have revered these objects for two centuries, while stories and attributions have multiplied the supposed relics many times over. Generations of curators have furnished presidential homes, and yet the research continues. Today's curators are concerned less with specific objects as decorative arts, and more with their meaning within the context of a person's accomplishments and relevancy in the rapidly changing world of the 21st century. George Washington's Mount Vernon was preserved for the nation as early as 1858; The Thomas Jefferson Memorial Foundation assumed ownership of Monticello in 1923; and, the Adams Historic Site was designated December 9, 1946. A late arrival, James Madison's Montpelier was restored and reopened September 17, 2008. Through diverse venues, today's keepers of presidential legacies are exploring new avenues—employing objects as spark plugs to engage visitors in pertinent, meaningful ways. The history of Presidents necessarily involves controversy—some of which is still sensitive today. These controversies challenge our visitors to think critically about the events and examine their own opinions about them. But creating exhibits to tackle controversy in an objective way can create problems for directors and curators. 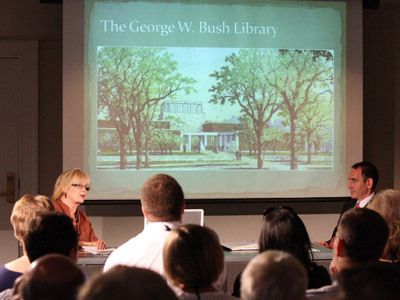 In this session, Sharon Fawcett discussed the background of bringing the Nixon Library and Museum into the National Archives Presidential Library system, and Tim Naftali described how the Nixon Library and Museum undertook an impartial presentation of Watergate through the use of oral histories. Examples of these oral histories will be played to demonstrate the power of the Watergate exhibit. 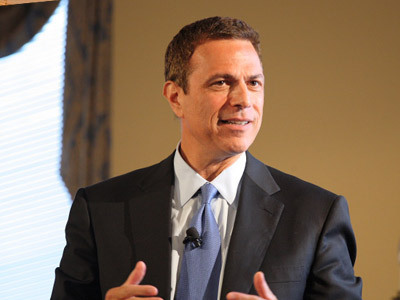 Beschloss has been called "the nation's leading Presidential historian" by Newsweek. 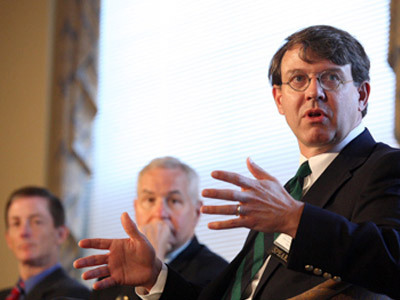 He has written eight books on American Presidents and is NBC News Presidential Historian, as well as contributor to PBS's The NewsHour with Jim Lehrer. His books include The Crisis Years: Kennedy and Khrushchev, 1960-1963; Eisenhower: A Centennial Life; Mayday: Eisenhower, Khrushchev and the U-2 Affair, which was adapted in February 1996 for an episode of the PBS series The American Experience; Kennedy and Roosevelt: The Uneasy Alliance; and At the Highest Levels: The Inside Story of the End of the Cold War with co-author Strobe Talbott. Mr. Beschloss holds degrees from Williams College and Harvard University. He has held appointments in history at the Smithsonian Institution, St. Antony's College, Oxford University and the Harvard University Russian Research Center. Annette Gordon-Reed, a professor of law at New York Law School since 1992, is recognized as one of our country's most distinguished presidential scholars. Professor Gordon-Reed earned a place in history with her first book, Thomas Jefferson and Sally Hemings: An American Controversy. Building on that earlier study, she wrote the first of two planned volumes of a history of the Hemings family. The first, The Hemingses of Monticello, won multiple awards including the 2009 Pulitzer Prize in history. Gordon-Reed is the first African-American to win the Pulitzer Prize in history. In addition to the awards listed above, Gordon- Reed has received a Guggenheim Fellowship for Monticello Legacies in the New Age, 2009; a Anisfield-Wolf Book Award for Vernon Can Read!, 2002; a Trailblazer Award, Metropolitan Black Bar Association, 2002; Best Nonfiction Book for 2001, Black Caucus of the American Library Association. She was Columbia University's Barbara A. Black Lecturer, 2001; and won a Bridging the Gap Award for fostering racial reconciliation, 2000.